Apple and Google have shown off their next-generation mobile OSes in recent months: in one corner, iOS 11 for iPhones and iPads, and in the other, the as-yet-properly-named Android O, heading to an Android device near you (maybe) in the next few months. Both these platforms have matured a lot down the years, but they still manage to come up with new innovations and new features as the mobile landscape continues to change. Here's what's coming - and which of these OSes you should be getting most excited about. There are a lot of little changes coming in iOS 11. The Control Center and lock screen have been redesigned, though we're not huge fans of the blocky new look of the former; a driving mode will cut out distractions while you're on the road; and there's a cleaner, more modern interface for the App Store, for example. ARKit looks like one of the most interesting new features - that's Apple's augmented reality pack for developers, and it means you'll soon be seeing a flood of apps that merge the real world with digital overlays (think Pokémon Go but with a major upgrade). From September you're going to be fighting aliens on your bedroom floor, testing out virtual furniture configurations in your living room, and much more. Siri is getting smarter, as you would expect, and will learn more about your preferences and tastes (though Apple is keen to point out that this information is kept private on your own device, in contrast to the way Google stores the data it has on you in the cloud). So for instance, your browsing history in Safari might prompt Siri to suggest a related story from Apple News. Maybe the biggest new features in iOS 11 are for the iPad, as Apple continues on its quest to turn its tablets into serious laptop replacements. A macOS-style dock is on the way for a start, and you can 'drag and drop' files, links, photos, text and more between apps without having to bring up the standard Share menu. In terms of the individual apps inside iOS, iMessages can now be synced between devices thanks to iCloud, while Apple Maps adds some indoor maps for places like airports and shopping centres. Apple Pay, meanwhile, lets you send payments to friends and family. That's just a sampler of the main points - Apple has added a host of minor improvements too. It's a solid if unspectacular step forward for iOS this year, with lots of new features that are very welcome but probably won't revolutionise your experience - except for maybe the augmented reality features and the extra desktop-like functions for the iPad. For this year's mobile OS refresh, Google's engineers have taken a few pointers from iOS - including the additional of dot notifications on top of app icons, so you can see with a glance at your home screen which of your apps need attention. Picture-in-picture support is being extended to work with phones as well as tablets too. Meanwhile a lot of the good stuff is hidden behind the scenes: apps are going to be more restricted in terms of what they can and can't do when they're not running, and that should lead to longer battery life and a more stable system overall. Also, keyboard support is improved, making it easier to run apps on Chromebooks and tablets with attachments. One of the most interesting new features is notification channels, which mean you can split your notifications up into types - so lower priority alerts can be shown and handled in a different way to emergency notifications. It sounds technical but it should make it easier to hide notifications that aren't so important, as long as developers add the functionality into their apps. As usual, a host of minor changes have been ushered in as well, including smarter text selection powered by a little slice of AI, so Android will recognise if you're trying to select an address (for example) and extend the highlighting for you. The auto-fill feature you might know from your browser is coming to apps too, which means less time typing our usernames and passwords. The malware scanner built into Google Play is being upgraded and made more prominent too, which means more peace of mind for end users, and based on the betas it looks like you'll have more control over the navigation bar and the information shown on the lock screen, though these tweaks are yet to be confirmed as final by Google. All in all another solid update for Android, though we'd say it's mostly about under-the-hood improvements than ones that users will actually see. Perhaps that's a sign of how much Android is already doing perfectly well that doesn't need changing. It feels like the days of game-changing upgrades in both iOS and Android have come to an end. Even in the design of these OSes - traditionally something that got refreshed quite regularly - the trend now seems to be for small refinements rather than big updates. 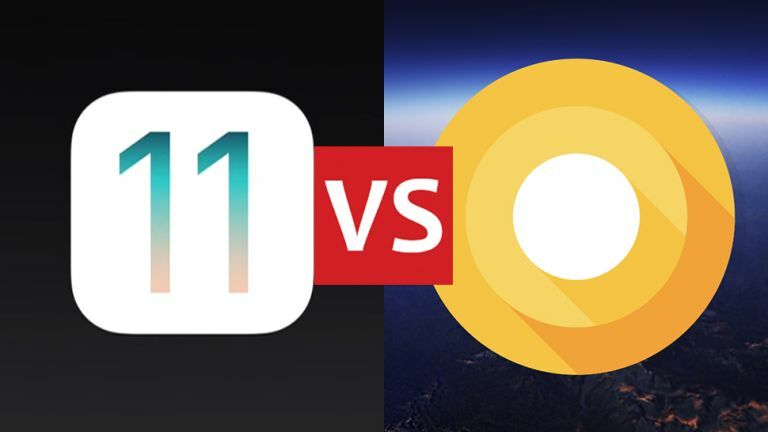 And both iOS 11 and Android O are solid upgrades, there's no doubt about that: with more features and improvements likely to be added before the OSes get pushed out later this year, users of any flavour of mobile OS can look forward to some fun new treats to play around with. However with the improvements to the software on tablets and the funky-looking ARKit in the pipeline, we'd say it's iOS that's seems to have the best new ideas at the moment (Google would point to its existing Daydream and Tango tech of course). The improvements Google is adding with Android O aren't quite as attention-grabbing, even if they are useful. It's also partly down to the nature of these companies and their software cycles though - Google tends to update its apps and services all year around, while Apple relies more on one big annual push, so you would expect a more interesting package. We're looking forward to seeing what comes next.